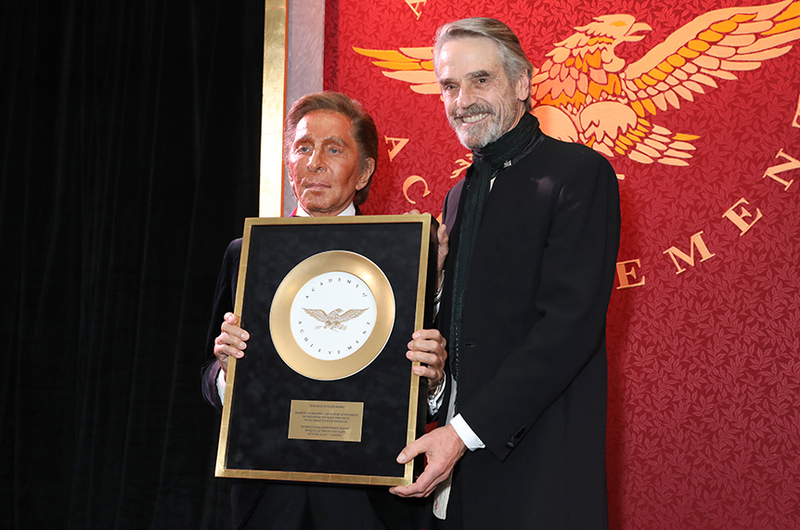 London, Thursday October 19, 2017 - Last night in London, Valentino Garavani was honoured by the American Academy of Achievement with the Golden Plate Award, making him the only European fashion designer, and third Italian to receive this prestigious honor. The two Italians prior to Mr. Valentino are both Noble Prize recipients, Dr. Rita Levi Montalcini, Noble Prize in Medicine (Class of 1970) and Dr. Carlos Rubbia, Noble Prize in Physics (Class of 1984). The Golden Plate Awards honours “visionaries and pioneers whose ideas and talents have influenced the world.” Previous recipients of this prestigious award include six US Presidents, world leaders and Nobel Peace Prize winners, technology and business leaders, world-renowned artists, athletes, authors and pioneering scientists and explores. That list includes; Barack Obama, Bill Clinton, Desmund Tutu, Steve Jobs, Bill Gates, Larry Page, Muhammed Ali, Bob Dylan, Aretha Franklin, Steven Spielberg, Elizabeth Taylor, John Updike, Norman Mailer, Jeff Koons, Frank Gehry, Edward Teller, James D. Watson, Neil Armstrong, Sir Edmund Hillary, and Sally K. Ride just to name a few. Mr. Valentino received this award surrounded by more than 20 of his closest friends and collaborators including Giancarlo Giammetti, Pierpaolo Piccioli, Princess Rosario Saxe Coburg, Eva Herzigova, Carlos Souza, Countess Charlene de Ganay, Bruce Hoeksema, Tamara Beckwith, Giorgio Veroni, Suzy Menkes, and theItalian ambassador to London Pasquale Terracciano and his wife, Karen Lawrence Terracciano. "“I am very humbled and grateful to receive this amazing honour. The past and present recipients are quite extraordinary and it is with great joy and respect that I accept this award, and that my work has been acknowledged amongst this esteemed group of leaders" says Valentino Garavani. The American Academy of Achievement was founded in 1961 by acclaimed photographer Brian Blaine Reynolds, it is a unique non-profit organization that “has sparked the imaginations of young people across America and around the globe by bringing them into direct personal contact with the preeminent leaders of our times” states their website. For more information on the American Academy of Achievement, please visit http://www.achievement.org/.